For other uses, see Westminster Abbey (disambiguation). The Collegiate Church of St Peter at Westminster, which is almost always referred to popularly and informally as Westminster Abbey, is a large, mainly Gothic church, in Westminster, London, England (UK), located just to the west of the Palace of Westminster. It is the traditional place of coronation and burial site for English, later British and later still (and currently) monarchs of the Commonwealth Realms. It briefly held the status of a cathedral from 1546–1556, and is a Royal Peculiar. 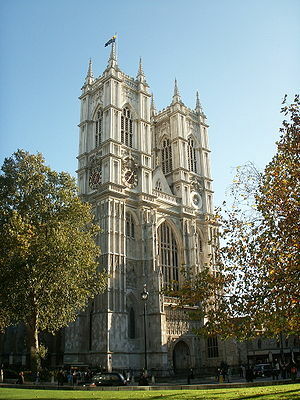 Westminster Abbey is governed by the Dean and Chapter of Westminster, as established by Royal Charter of Queen Elizabeth I in 1560, which created it as the Collegiate Church of St Peter Westminster and a Royal Peculiar under the personal jurisdiction of the Sovereign. The members of the Chapter are the Dean and four residentiary Canons, assisted by the Receiver General and Chapter Clerk. One of the Canons is also Rector of St Margaret’s Church Westminster Abbey (who has also often held the post of Chaplain to the Speaker of the House of Commons). In addition to the Dean and Canons there are at present two full time minor canons, one precentor, the other succentor. The office of Priest Vicar was created in the 1970s for those who assist the minor canons. Together with the Clergy and Receiver General and Chapter Clerk, various Lay Officers constitute the College, including the Organist and Master of the Choristers, the Registrar, the Auditor, the Legal Secretary, the Surveyor of the Fabric, the Head Master of the Choir School, the Keeper of the Muniments and the Clerk of the Works, as well as twelve Lay Vicars and ten of the choristers and the High Steward and High Bailiff. There are also forty Queen’s Scholars who are pupils at Westminster School (the School has its own Governing Body). Those who are most directly concerned with liturgical and ceremonial matters are the two Minor Canons and the Organist and Master of the Choristers.